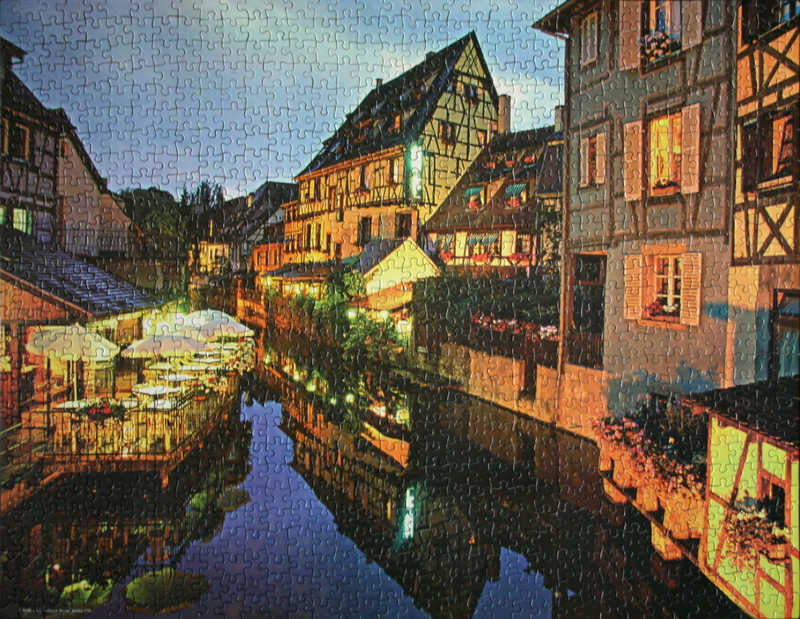 Puzzle: Beautiful puzzle, not completely trivial, due to many small colourful regions. Some of the best places to tackle first are the blue of the sky and the water, sky and rooftop boundary, bright yellow regions, and the orange and grey building in the right quarter of the picture. The white umbrellas, green neon lights, umbrella reflections, and tall building in the centre and its reflection can be assembled next, leaving many smaller regions to complete the puzzle. Notes: Colmar is the third-largest commune of the Alsace region in north-eastern France. Colmar was founded in the 9th century. Colmar’s secular and religious architectural landmarks reflect eight centuries of Germanic and French architecture and the adaptation of their respective stylistic language to the local customs and building materials (pink and yellow Vosges sandstone, timber framing). architecture, France, puzzle, water. Bookmark.